CA110ES Card Swipe Safe is rated 4.4 out of 5 by 14. The SentrySafe CA110ES is built with solid steel construction and motorized live-locking bolts to help protect your valuables from unauthorized access. A card swipe reader, digital lock, and override key offer advanced security for your business assets. 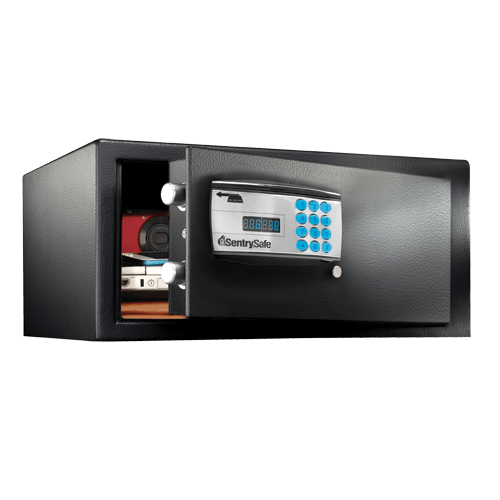 This reprogrammable lock includes a digital key pad with card swipe access, allowing you to enter a code or use any card with a magnetic strip to open and close your safe. No personal information or credit card numbers are used in this operation. Designed to emit a loud alarm when your safe is picked up or moved, the door is pried open, or five wrong code attempts are entered. Comes with a dual key for added security. Rated 5 out of 5 by nobarking from Perfect Safe for Our Home We had already sent back a different but defective brand purchased at Amazon and stumbled upon the Sentry at Costco. It seemed ideal. Well made, the CA110ES is spacious, deep and wide. You can easily slip a stack of legal-size documents into it, with room to spare for your handgun case, even a laptop. When its dark, a light on the inside of the door illuminates the contents. Operationally, we think the PIN-code method is ideal. I also tried the credit card swipe method and it works great. You can't use both at the same time. You can (and should) bolt the safe to a sturdy shelf, even to a wall. The case is bored with bottom and back mounting holes and four hefty screw-bolts are supplied. You could also use stove bolts cut to exact length. A burglar with leisure time would have great difficulty removing stove bolts in order to literally steal the safe. My sole negative: the two emergency keys are huge. Instead of adding one each to our key rings, we need to find a safe place for them. No, dummy, not inside the safe. Great safe. Great buy at Costco. Rated 5 out of 5 by gt70 from Sentry Swipe safe Perfect size. Easy to program and use. The price is great for what you get for the money! Rated 4 out of 5 by Joe367 from Easy to Operate This safe is similar to many I’ve used in hotel rooms. Easy to operate and the interior light is a plus. Good item for secure storage of often used items, although it is not fire protection. I have a larger fireproof safe to protect my valuables, this is a nice easy access compliment to my big safe. Rated 5 out of 5 by Pasternak from Works & unlikely to lock myself out of this one! It’s large. It works well. Love the key/combination/card swipe alternatives and registration for key replacement because I tend to lock myself out of these things. Rated 4 out of 5 by Northern Flicker from Nice safe for the price The safe has good size volume,pre drilled holes so you can fasten it to a solid surface.Easy to program and auxiliary external battery holder is a nice touch. Rated 4 out of 5 by Vinadir from Portable safe Safe is portable and light enough for to lift to transport and carry for temporary storage in case of extreme weather conditions. Rated 5 out of 5 by S Kay from Compact The size and durability of this safe ideal for my use great addition for storage of documents and quickly accessible.